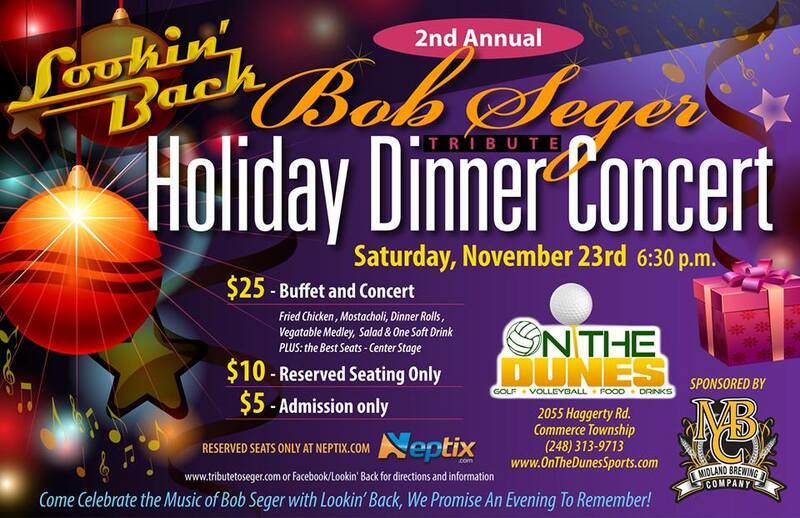 Commerce Township, MI: On November 23rd Lookin’ Back and Midland Brewing Company present the 2nd Annual Bob Seger Tribute Holiday Dinner Concert at On The Dunes Sports facility at 2055 Haggerty Road in Commerce Township. What was once an abandoned Erb Lumber yard now stands a completely remodeled state-of-the entertainment complex featuring a 2500 square foot dance floor, a major league stage, eighty widescreen and projection TV’s, 8 virtual golf simulators, an outdoor patio overlooking ten deep sand beach volleyball courts, an arcade room with pinball, ping pong, air hockey, corn hole (bean bag toss), video games and a pool table. 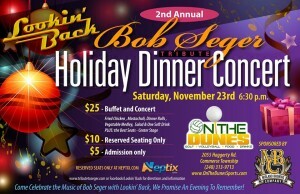 The 2nd Annual Bob Seger Tribute Dinner Concert will mark Lookin’ Back’s eightieth performance since their August 2009 debut and the last public performance of a busy 2013. Since its inception, Lookin’ Back has racked up some pretty impressive accomplishments that include performances with Seger’s own Silver Bullet Band founding members, Charlie Martin (drums) and Alto Reed (sax) on four separate occasions. Lookin’ Back has also rocked some of Michigan’s largest festivals and many private parties from Ohio’s Catawba Island Yacht Club to Detroit’s Athletic Club, even major league sport venues as The Palace Of Auburn Hills and, on three occasions minor league baseball’s Whitecaps Stadium in Grand Rapids. 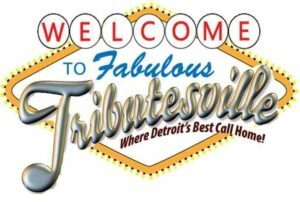 Lookin’ Back’s founding member, leader and tribute band booking agent, drummer Todd Stoney stated, “Our second holiday concert, much like our annual Bob Seger Birthday Bash each May, moves to different venues throughout Metro-Detroit to be fair to many enthusiastic Bob Seger music fans that drive from afar to engage with us. It’s literally a Bob Seger music love fest for us all.” This event was held in Macomb County’s Shelby Township last year. It’s no surprise the Detroit market has no shortage of outstanding musical talent and Lookin’ Back’s 2013 regular and alternate musicians line up are but some of Detroit’s premier players including Chuck Bartels and Johnny Abraham on Bass, James Hughes and Carl Cafagna on saxophone, Paul Cervenak and Jim Molnar on keyboards, Scott Kenerson and Pete Peltier on Guitar, with Todd Stoney on drums and Jeff Zook covering lead vocals. The band is poised and positioned for a very busy 2014 with at least eight shows already scheduled. The official schedule will be announced at Lookin’ Back’s 5th Annual Bob Seger Birthday Bash May 10th at a venue that Mr. Seger himself performed in the late 1960’s, ironically. And with the next two public shows being in proximity to Mr. Seger personal residence, the band hopes he and the family might simply drop in to say hi and feel the love. That would surely be a special treat for all involved.